NOTE: Permanent Sports Felt isn’t usually sewn onto the garment as the adhesive backing was developed for a permanent bond using a heat press. Q: What Is Permanent Sports Felt? A: Permanent Sports Felt is a non-woven Acrylic Felt that utilizes an adhesive coating (P600 5-Mil 49.5″ Permanent) so that it can be cut easier, re/positioned and heat pressed. Because Permanent Sports Felt is a non-woven material there is minimal fraying (if any), making it much easier to achieve a clean cut. Q: Is The Permanent Sports Felt PVC-Free? A: Yes. Acrylic Felt and our proprietary Permanent adhesive is 100% free of PVCs. Q: Can I Layer The Permanent Sports Felt? A: Only if it’s being sewn can it can be layered 2 or 3 layers thick on itself or Sports Twill or other applique material for multicolor designs. If used with Metallic Twill, we DO NOT recommend the Metallic Twill as the bottommost layer (background). Q: Does Permanent Sports Felt Have An Adhesive Backing? A: Yes. The thermal adhesive backing provides stability for cutting and heat pressing onto garments. Its polyester-based coating has no PVC and can be cut on craft cutters, dies, lasers, Ioline flatbed cutters or even hand-cut. This adhesive system — (P600 5-Mil 49.5″ Permanent) — is available separately for coating materials other than Permanent Sports Felt. NOTE: May be too thick for some plotter cutters. Q: Will The P600 5-Mil Permanent Adhesive Gum Up My Sewing Needles? Q: Can I Cut Permanent Sports Felt On A Tabletop Plotter? Q: What Blade Should I Use To Cut Permanent Sports Felt? A: A 60° blade works best for cutting Permanent Sports Felt. On some machines it’s called the “thick” blade. Machines vary, but 150 grams of downforce is usually sufficient to get a clean cut. A: No. This is a heat seal product designed to be heat-pressed onto garments. 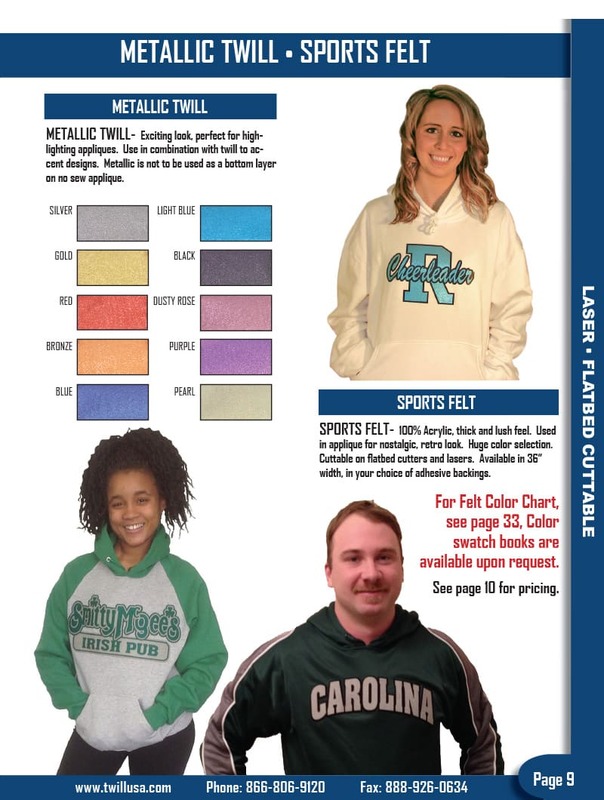 If sewing is important, please consider our Polyback, PSA or PSA Permanent Sports Felt instead, which can be sewn on or heat-pressed then sewn onto the garment, respectively. Q: How Is Permanent Sports Felt Different Than Scrim Felt? A: Scrim Felt is a coarse, less dense — albeit heavier and stiffer than Acrylic or Wool — fabric typically used as a lining or background material. In the apparel world, Sports Felt is used as an applique material. It is a more densely constructed fabric used for finishing garments. Q: How Long Does Permanent Sports Felt Last On The Garment? A: Acrylic Felt is washable. We have tested this material up to 50 wash and dry cycles in a home laundry environment without fraying, cracking or peeling. Q: Can Permanent Sports Felt Be Used To Decorate Letterman Jackets? A: Letterman jackets are typically decored with chenille letters, which are several times thicker than Permanent Sports Felt letters. Felt can be used on jackets, but it won’t be as thick, which can be an advantage in terms of flexibility. Custom Felt designs are also less expensive, with more color options, and delivered faster than chenille. Q: Can I Use Permanent Sports Felt To Embroider Iron-On Patches? A: Permanent Sports Felt can be used for that purpose, although most patches are made from polyester Sports Twill.